This photo falls under the Minimalism as Simple Geometry category. The intent here is to show Lines. There are various ways one can show lines in a photograph and this is one way. 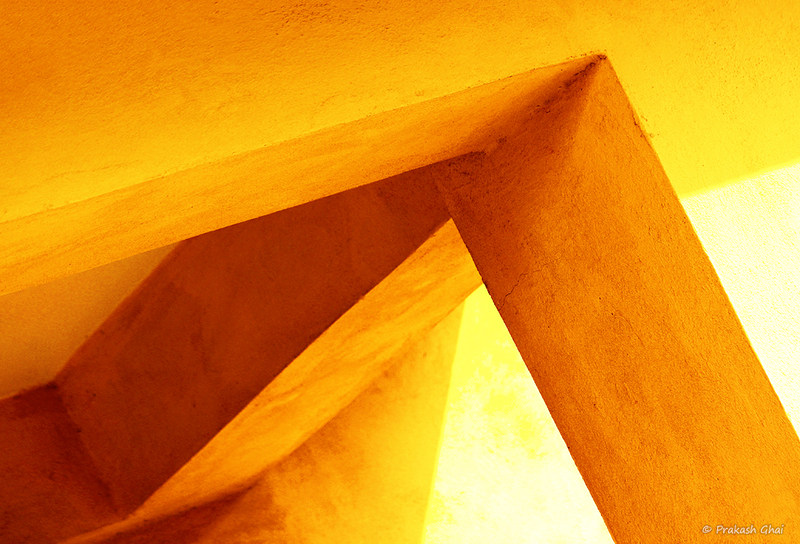 To begin with, pick a corner of a geometric structure well lit with sunlight. Then, twist and turn the camera and try multiple placements of the subject using the in-camera 3x3 grid lines. Pick one such placement that appeals to your mind and its done. Later, in editing you can add a bit of sharpness and grains. Grains look really nice on some photos, they are added on purpose here. There are two ways of adding them a) Use a high ISO setting of about 800-1600 on a crop-sensor camera or slightly higher on a full-frame camera or b) by Simply adding them using a photo editing software. You can also brighten the photograph a little or adjust the hues and saturation, if you aren't satisfied with the original photo. Please make sure that you don't over do the editing part.